As is well known, Sirius is the brightest star in the night sky at magnitude -1.37. Hence it’s spectrum can be photographed with short exposures. The first image that I show here was done in positive spectral orders (spanning +1 and +2) so is mainly of low dispersion. With my spectrograph, positive orders have longer wavelengths on the left and shorter on the right but I have standardised by displaying the image in the opposite order. Hence, I have reversed them in Photoshop by rotating 180 degrees. Click the thumbnail to see the full-sized image. 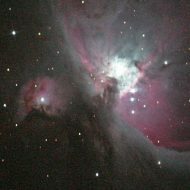 The exposure was 4 seconds at ISO1600 on the 10” Schmidt Newtonian (f4). The focus was not as good as I hope to be able to get. Nevertheless, I am confident that the spectral lines are accurately portrayed and that the image has been analysed successfully as given below. This is an unusual looking spectrum. It looks as if the shorter waves (blue) might be at the right, in spite of my above comment. However, it does go from about 6500A on the left to about 8800A on the right, in first order. At about 7800A, the second order (at 3900A) starts and the blue of the second order dominates the image, going to about 4400A. By viewing the image in Photoshop in the Red channel, the first order can be isolated and by viewing in the Blue channel, the second order can be partially isolated. Based on Hβ, in second order, being at X = 2138 and Hα, in first order, being at X = 127, I estimate the linear dispersion to be 1.054A/pixel in first order, meaning it is half this, i.e. 0.527A/pixel, in second order. Several Excel charts have been created and often they show the form of the spectrum better than does the image. This also covers the Atmospheric O2 band B, said to be at 6884A. The wavelength of Hα is 6563A and it is at X=127 and the bottom of the dip for the O2 band is at X = 431. The next chart covers the region of the atmospheric O2 band A, said to be at 7621A. The bottom of the dip is at x = 1129. The next chart covers the region from 8220A to 8750A. This includes the Ca II lines at 8498A, 8542A, and 8662A. It also covers several of the Hydrogen Paschen series lines in the near infra red. These are at 8416A, 8440A, 8470A,8505A,8548A, 8601A, and 8667A. However, these lines do not appear to be clearcut on the image or the graphs, so this region can be considered suspect. A graph from 4095A to 4370A is shown below. Note that the horizontal axis is based on the first order wavelengths so the values have to be divided by 2 to give the correct wavelengths. It includes H Delta ( or H6), which is at 4102A and Hγ ( or H5) at 4341A, both in the Hydrogen Balmer series. The spectrum does not cover Hβ (4861A) in either order. These are at pixel positions 1679 and 2138 on the image. H6 is about 2A too low on the chart – it is not possible to claim greater accuracy than about 2A. The Ca line at 3934A can also be seen on the image (at X = 1363), but the Ca line at 3889A requires more exposure to be definitely observed.